The beginning and ending are the most important moments of everything. Birth and death. First day and last day at a job. New moon and full moon. The beginning drives expectation and intrigue. The ending gives a new meaning to everything that happened in between. If episode 1 of a new series doesn’t grab your attention, your likelihood of ditching that show increases exponentially. While a great season finale will get viewers to continue watching when the series begins again. Successful screenwriters understand their success depends on great starts and endings. And that’s also true in your life. How you begin and end your day will define your ability to achieve things and feel happy. 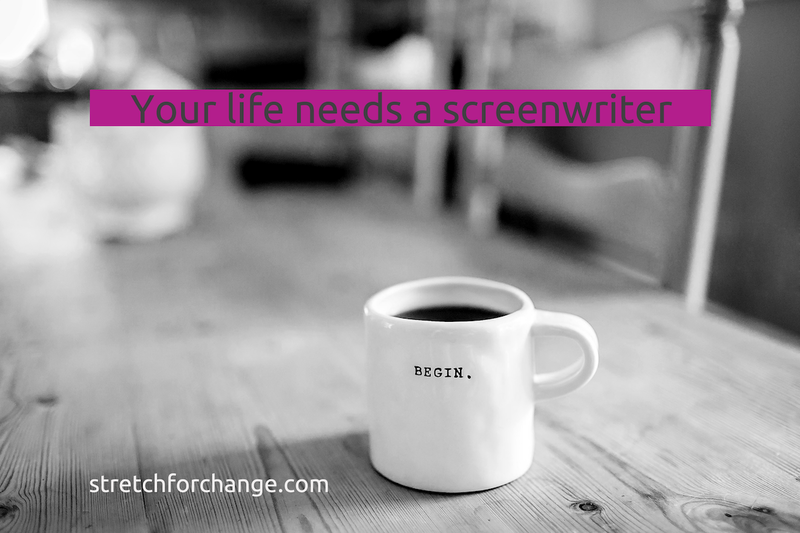 Your life needs a screenwriter. And no one can do it better than you. A great beginning will keep you engaged with your own story as the hours go by. You don’t want to ditch your dreams by noon. Finish each day with a story that you want to remember forever. How you end your day impacts the mood you wake up in next morning. The stories you tell yourself affect your mind and emotions. Anxiety, negativity, and self-destructive thoughts are connected to the stories we tell. You cannot control everything that happens in your life. But you can control the story you tell yourself. You are the actor and spectator of your life’s plot. Become the screenwriter too. Today’s stretch: start and finish your day purposefully. Start your day by preparing your mind to achieve your dreams. Your mindset is like soil where your ideas and desires grow. The right preparation — making it more fertile — causes your dreams to bloom bigger. Avoid all distractions. Don’t check social media, the news or anything that can negatively affect your mood. Or, even worse, derail you. Before you move into action, spend time with yourself. Sit down and stretch your body for a minute or so. You are sending your body a signal: it’s time to wake up. Follow this routine. You don’t need experience meditating to practice it. Sit down in a position where your body feels comfortable and relaxed. Try to visualize how the air flows through your body. Reconnect with your body, feel the energy flowing freely. Continue breathing with intention along the rest of the exercise. Reconnect to how you ended your previous date. Remember the things that you were thankful for (see night exercise). Use that gratitude to drive energy to your body. Focus on your dreams and goals. What keeps you excited? What’s your life purpose? Which areas do you want to strengthen? Now focus on what you want to accomplish today. What will help you achieve your life’s purpose? What things will make you feel happy? What tasks or things can steal your time or energy? Once you’ve finished, take another deep breath. Open you eyes slowly. Capture your dreams and goals on a piece of paper. Write down your priorities. Write down the distractions you want to avoid. Now it’s time for exercising, taking a shower or having breakfast, whatever’s your regular routine. One caution though: avoid checking emails, your phone, etc. Unless your life or job depends on early morning updates, postpone the first contact with your device for as long as possible. End your day in a way that you feel grateful and fulfilled. Every chapter of your life deserves a happy ending. Prepare your mind for sleeping. First, you need to slow down. At least one hour before bedtime, unplug from electronics, emails, social media, TV, etc. Too much light from screens at bedtime affect the melatonin production. Your body gets confused and thinks you are not ready for sleep. Avoid other distractions that can make you worry. Reading is excellent to help you relax instead. Before you go to bed, sit down in a comfortable position and take 2–3 deep breaths. Feel how the air flows through your body. Reconnect with your body. Take deeper breaths and focus on the areas where you feel pain. Focus on those areas. Visualize how the oxygen flows to those specific zones alleviating the pain. Continue breathing. Reconnect with your day. Is there something that worries you right now? Write it down. Visualize how your worries move from your head to the paper. Focus on your achievements. Write down everything that made you happy, the things that you liked, what you should be thankful about. The purpose is to finish your day celebrating what you’ve achieved instead of complaining about what went wrong. This exercise is powerful. It will take time until you fully benefit from it. The first days, you most probably will find hard to identify your achievements. Unfortunately, we are wired to remember the bad things. As you continue to practice it, your mind will become better at “remembering” the good things. Focusing on the positive will feel more natural. Your list will become longer and longer before you’ve even notice it. Slow down. Wrap-up your day being grateful for everything that went well. Your mind and body will go to sleep in a happy mood. Both the beginning and ending exercises feed-off each other. Like any great plot. Remember, live a life worth binge-watching. Change happens one stretch at a time. Each day I post one exercise to help you grow beyond your comfort zone. Return To Your True Nature As A Woman To Enhance Your Energy And Productivity.